For many years Hall Farm stood on the Market place near the junction of Nottingham Road, now the site of the French Horn public house. It was built sometime in the mid 1700s, the earliest reference I have is a newspaper article dated 19th August 1768, which advertises Hall Farm to Let. as it has been newly and nearly fitted up, it would accommodate a Gentleman’s family or a Gentleman farmer. Newspaper article courtesy Martyn Taylor Cockayne. In 1817 the farm was visited by the Pentrich Revolutionists in search of arms and men to add to their ranks. Mr Stirland was the owner at the time and he had several farm hands working for him. The revolutionist took varies pitch forks to use as weapons and were just about to leave when they noticed some of the farmhands hiding in the barn. Two of the conspirators; William Turner and Samuel Hunt removed four of the men and forced them to join their ranks, threatening them with the same fate as Mrs Hepworth’s servant if they refused. (Mrs Hepworth’s servant, Robert Walters was shot and killed by the revolutionists at South Winfield the previous evening). They took Mr Stirland’s men and continued down Nottingham Road to the old French Horn pub. The revolution came to an end later that day when they were intercepted near Giltbrook by mounted troops from the local barrocks. The following paragraphs are copied from Joseph Millot Severn’s book “My Village” and they describe Hall Farm where he worked as a young boy in about 1870. Mr. and Mrs. John Stirland owned and lived in the farmhouse, which stood a little distance back, with a large garden and stonewall in front, at the commencement of Nottingham Road. It was known as the Big White House. In Mr. Stirland’s time it was always kept nicely whitewashed. Being large and well situated, compared with the rest of the village houses, it stood out as a conspicuous country gentleman farmer’s residence. During the last few decades it has been sadly neglected. There was a wide gateway leading to the house and farm, with a large ornamental swing gate, and a corresponding smaller gate at the side, and to the left of the entrance was a pond, and well kept road made of red minion. By the gable end of the house grew a large pear tree; and just inside the door of the backway entrance was a deep well of delightfully cool, clear spring ‘water. The well top was constructed of moss-covered stone slabs, with a very large ironbound oaken bucket, which was wound up by a chain. That well-known song by Samuel Woodworth, so charmingly descriptive of “The Old Oaken Bucket that Hung in the Well,” might have had its inspiration here. As we were tenants of the farmer, we were privileged to use this Well, and directly I was big and strong enough to wind up the monster bucket, which held two large pails of water, it became one of my duties to fetch it. That was before I was ten and a half years of age, because soon after this I became the farmer’s boy, and worked on the farm for a year, covering the seasons of spring, summer, autumn and Winter. I had sixpence a day wages, and my food. Though the Work was hard and the hours long, and bitterly cold in the Winter, I never regretted this year’s farming experience. We used to shear with the hand sickle in those days, thrash wheat in the barn with the flail, and the largest implement then in use was the bonny-rake. Mr. Stirland was a contrast from the usually big, brawny farmer. He was a short, spare man, with a round face, ruddy complexion, and a bit short-sighted, but typical of the gentleman farmer. Whilst he superintended and directed, he rarely worked himself; yet he was not a lazy man, but quick in movement, and got about a good deal. He was a regular attendee at the church, which benefited considerably at his death. Besides other lands, he gave the large field at Codnor Gate, which has made such a delightful site for residential building; purposes. It was one of our hay fields when I worked on the farm. Mrs. Stirland was a fairly tall, big woman, and as big-minded as she was physically well proportioned; having much practical common-sense judgment and self-possession; was good-natured and considerate of others, there was nothing mean in her disposition. They had every appearance of being a very suitable and happily married couple. After her death, Mr. Stirland’s niece, Miss Stirland, kept house for him. She was a very nice, refined lady, a great help, interested in the doings at the farm, and considerate of her uncle’s Welfare. After the death of Mr. Stirland, Dr. Woolley of Heanor bought the house and farm and nearby fields, and immediately began to make it a more exclusive residential place. He had a plantation set, commencing at the bottom of the front garden, extending round the end of the adjoining field, where the Almshouses now stand, and some distance further along, so as to block out the view of the high road, and the houses at the top of Goose Lane. Similarly a plantation continued around the top part of the field overlooking the market place, and blocking out the view from the cottages at the back of the New Inn. In the course of a few years they grew into trees of considerable size and height, intermixed with smaller trees, evergreens and shrubbery, so more or less shutting in the estate from public view. A considerable amount of money must have been spent in doing this, but don’t remember Dr. Woolley having lived there himself. Something prevented him, or he had other reasons for making all these specific alterations; hence the farmhouse eventually became to let, though he retained one of the front rooms as a surgery for his local medical assistants. One of the first tenant farmer’s was Mr Gill and he was followed in the early 1900s by Matthew Steeples and his wife Mary who had three daughters; Dorothy, Hilda and Maggie, and three sons; Matthew who had his own Butchers shop at Marehay and Harvey and Norman, who both worked on the farm. The following is a summary of a terrible tragedy that occurred at Hall Farm and was published in the Ripley & Heanor News, Friday 7th June 1912. During Sunday 2nd June 1912, Norman had complained of a pain in the back of his neck and also everything looked large to him, but he didn’t feel unwell at all. In the early hours of the following morning, Harvey awoke to find his brother Norman was not in bed. Dear father, mother, brothers and sisters. By the time you get this I shall be dead. I cannot sleep and my head is like machinery going. Tell mother I shall meet you on the other side. Norman had drunk enough Strychnine from Dr. Woolleys surgery room in the house to kill fifty people then thrown himself down the well. Harvey ran outside to find the door to the well open and an empty Strychnine bottle nearby. The coroner’s verdict was that the deceased had committed suicide by drowning after having taken poison, whilst in an unsound state of mind. The Steeples continued to run Hall Farm into the late 1930s after which it was taken over by Bert Parr, who remained there until the farm was taken over by the Butterley Company in 1947. One of the last tenants of Hall Farm was George Searson, who used to deliver milk. 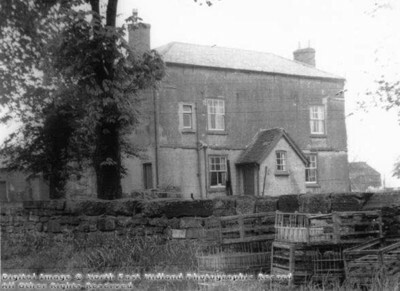 The farm was demolished in 1963 to make way for the building of the new French Horn public house. The original pub stood a little way down Nottingham Road but suffered badly from subsidence. 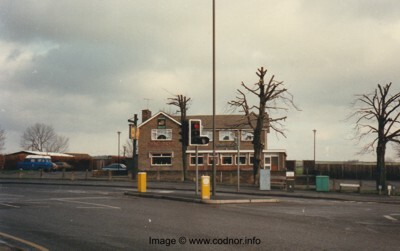 This is the new French Horn public house built on the location of Hall Farm after it was demolished in 1963.